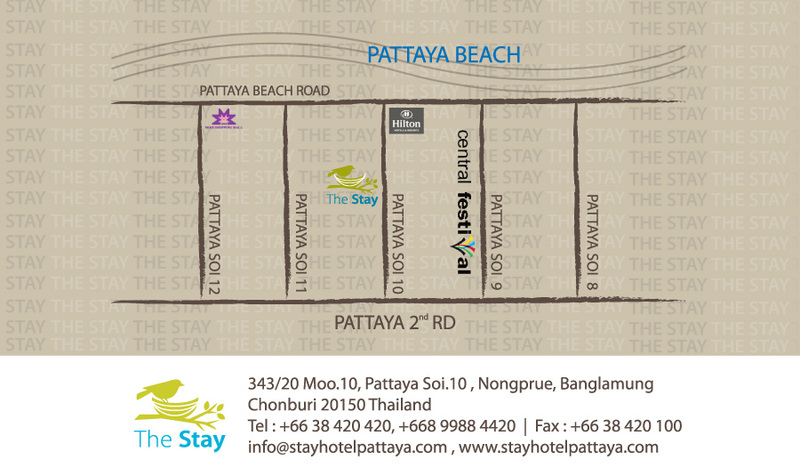 Location, Location, Location – In the middle of Soi 10 Pattaya, Centrally located in the heart of Pattaya City within walking distance to the Beach, Central Festival Pattaya Beach, and Entertainments. The Stay Hotel puts the city easily within reach. Contemporary stylish design, whether you are staying with us on business or leisure, we offer a range of services and amenities to make your stay exceptional. Relax in one of our comfortable rooms and take advantage of our great services, including rooftop swimming pool, fitness center, free Wi-Fi Internet access in our rooms, Internet Corner, restaurant and bar.